They just love him in Russia. The Hollywood actor has been doing his part in mending relations between America and Russia. 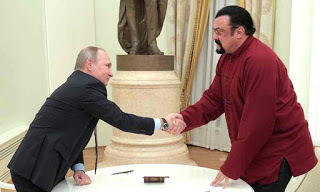 Recently, Steven Seagal received a Russian passport from President Putin. So, if you didn't know already, the world's favourite '90s ponytailed action star Seagal has been making some serious waves in former Soviet countries. Here is an impressive rundown of his foreign affairs exploits: He's been fed carrots by the Belarussian president, rode a horse at the World Nomad Games in Kyrgyzstan, and hung out quite a bit in Russia, where he's now a citizen of the country! A staunch celebrity supporter of Donald Trump, the actor who has not been very active in movies,recently became quite active as a statesman. Seagal went to pick up his Russian passport in Moscow on Friday. He didn't get it from some random bureaucrat, however. Instead, he received it in person from the country's president Vladimir Putin. What else for the star of the classic Under Siege? Seagal and Putin are good friends, and the Russian President is a big fan of martial arts,and we all remember how Seagal dazzled us with his skill in several movies. Scroll down for video of Seagal, a Black belt, demonstrating his impressive Akido skills in Russia. Putin signed the passport at the ceremony, hoping the deed would help improve the relationship between the U.S. and Russia. Here is Putin's statement during the passport presentation. "I would like to congratulate you on this occasion and express the hope that this is yet another gesture, probably a small one, but still a gesture, and may indicate a gradual normalization of our interstate relations," Putin said, according to a Kremlin transcript. Happy to be of help. Seagal told Putin he was "honoured to be here" and was "happy to see" him again. The U.S. action star also became a Serbian citizen earlier this year. One more passport surely wouldn't hurt, would it?